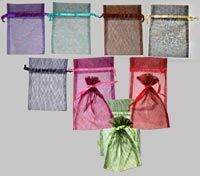 5 x 7 inch Wild Print Organza Bags. Beautiful bags that make anything look classy when it comes inside one of these! Add several products in several bags and place in a basket for a really cute gift wrapped package. 6 bags per pkg of one color. Pouch area dimensions are approx: 5 x 5 inches.